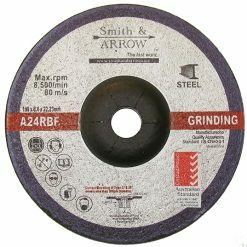 Smith & ARROW depressed centre Grinding Discs are excellent for grinding steel and all metal. 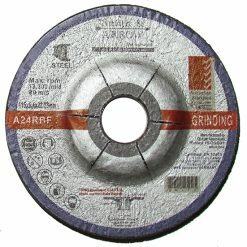 This is a commercial grade product that is of superior quality. 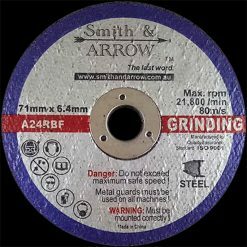 Effective grinding requires fabricators to apply enough pressure at the correct angle to let the grains remove the most metal in the shortest time, while not prematurely wearing the disc or burning out the grinding tool. 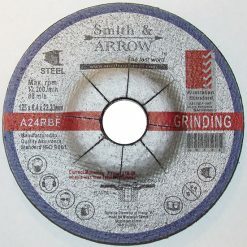 Smith & ARROW grinding wheels will assist with this process, allowing you to grind effectively, with low disc turnover. 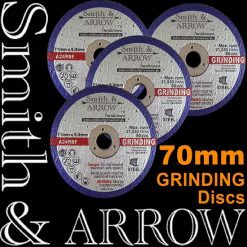 Our grinder discs are optimised for heavy industrial usage, providing the most efficient output on high powered angle grinders in removing welds, preparing welds and general surface grinding. 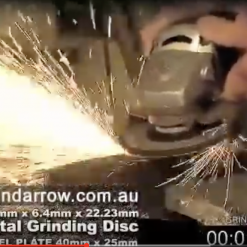 Additionally, all our grinding wheels are certified to the Australian Standard “5 Tick Mark”. 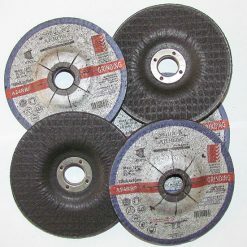 This means our safety and quality are of the highest standard possible. 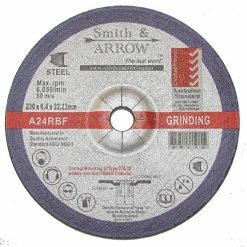 Grinding discs are available in 3” 70mm / 4” 100mm / 4.5” 115mm / 5” 125mm / 7” 180mm / 9” 225mm and are designed for use on an angle grinder.